Discussion in 'Forza Motorsport 7' started by GTPNewsWire, Nov 15, 2018. 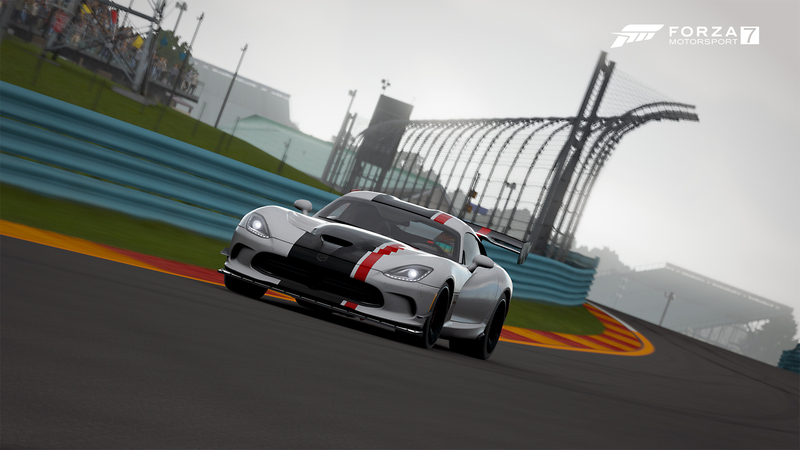 This article was published by Michael Leary (@Terronium-12) on November 15th, 2018 in the Forza Motorsport 7 category. There aren't any cars on that list I don't already have, and I have plenty of credits. Still, I ran it long enough to put in a clean lap. Now if they included the Ford Raptor FE (which has been locked since the game was launched over a year ago) or the new Trans-Am FE, then I'd have something to shoot for. I'd guess you already know but just in case, the Trans-Am FE is a reward for the current spotlight rivals with the 917/30. My last check saw the fastest T10 member at a 1:11.0 for this and the fastest guys are running 1:08.4s so there is quite a margin there on this relatively simple track. AlienDeathRay and Populuxe Cowboy like this. Actually I didn't know that. Glad I've put in my time for the 917/30 challenge. AlienDeathRay and Im_Lukas like this. Again, curious, that for some reason the Ford Raptor FE is being held back from us. I guess they think once I get all the content I will never play the game again. But they are wrong! I have a looooong way to go! Quite a fun car/track combo. Simple track layout mind. Full throttle from T2 - T5. Viper at Watkins? OK... Sounds fun. Now time to read the article and see what's actually on tap. IMO Turn 10 should better communicate whats happening in game. Have it as something I can look for and at. Dont throw it in my face when I am logging on to do something else. I will generally clear the message and not care about what it had to say. And more importantly, don't refer me to a website. I'm trying to play Forza with the limited time I have. I don't want to spend that time reading 9 point text on Turn 10's blog. That's why I am in the dark about a lot of what's happening with Forza. 5 minutes later, and I am squared away on what's happening. Now to improve my times. Im_Lukas, vinz7531 and AlienDeathRay like this. it's true rewards for events are not always stated. I know bounty hunters have rewards , so I do them seriously, but I generally don't know what until later when I get the info from here. Spotlight rivals also have participation rewards most of the time. I got my time down to a 1:12.688 That is about as low as I can get. Being that is about 4 seconds off the leader, (I'm normally about 7 seconds), I am good with that. Not many places on the track to dig out more time, as Watkins Glen Short, is pretty straight forward with few turns. That being said, I can't see how anybody can get it below 1:10. This is still open? If so, I wonder how I would do with the new FFB? I'll find out when I get home. Oh well. Free play in a stock Viper, here I come. I gave it three casual laps and my rewards summed up to a million credits. Nice accumulation for so little effort, but I already had all the cars gifted to me.